Tis the season for trimming the tree, caroling, baking cookies, and curling up by the Yuletide waiting for Santa to drop down the chimney. But in this festive collection of holiday whodunits, murder is also paying a visit. 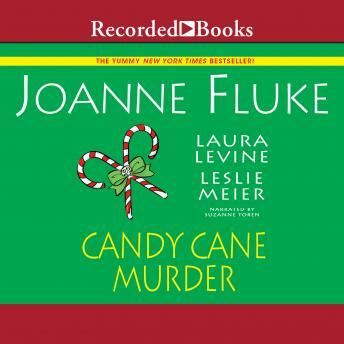 "CANDY CANE MURDER" by JOANNE FLUKE When a trail of candy canes leads to a corpse outfitted in a Santa suit on a snowy bank, Hannah Swensen sets out to discover who killed Kris Kringle. "THE DANGERS OF CANDY CANES" by LAURA LEVINE A wealthy suburbanite takes a lethal tumble off his roof while installing a giant candy cane. Now it's up to Jaine Austen to sift through a long list of scheming neighbors with dirty secrets in their stockings to expose a murderer. "CANDY CANES OF CHRISTMAS PAST" by LESLIE MEIER Lucy Stone must learn the mystery of a glass candy cane that was found smashed to bits by a corpse's body to unlock the doors of Christmas past-and find a killer who got away with murder. Whether a gift for yourself or that special someone on your list, there's no better way to spend the holidays than with these tantalizing mysteries of murder.